When a stranger demands that you take off your shoes in public, it usually means you're about to get on a plane. But at David Zwirner Gallery—known for its blockbuster installations and huge lines of fans who come to Instagram them—you're about to experience an otherworldly installation. The airport comparison is actually pretty apt. The artist behind the gallery's current show, Doug Wheeler, is an avid pilot—he is fascinated by the sky and earth, and his immersive light sculptures seem to draw from the lonely travels of a celestial navigator. The light that emerges from this shape is almost like a halo or aura—it feels like you're walking into a fog of blue light. 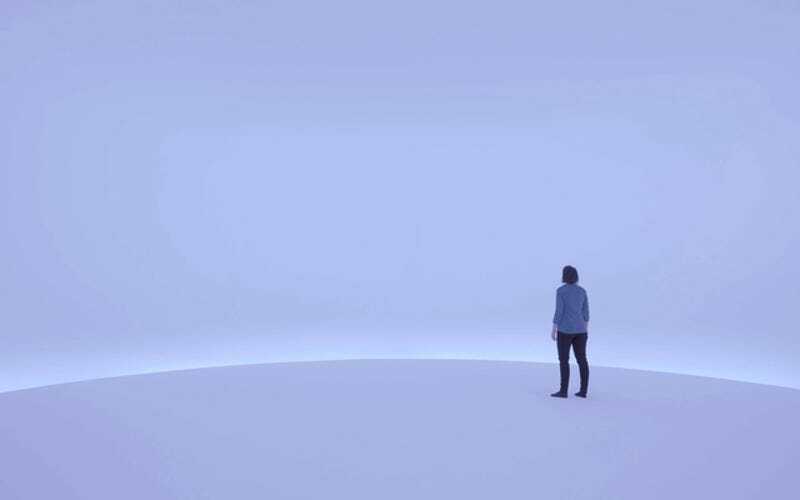 But once you step over the threshold and onto the smooth white floor inside, everything changes: Now, you're inside a spherical hall with absolutely no defining features—like an IMAX theater covered in white plaster. The strangest part? Your only point of reference is yourself—and the door you came in through. Otherwise, you could be in a room as big as Madison Square Garden. It's impossible to tell how high the ceiling is. The blue light turns you and your companions into stark, blue-tinted creatures. The Earth's horizon seems to move around you, as though you were in a jet far above the Arctic Circle. In fact, the curators describe the effect as "mimicking the sensation of the earth's rotational pull and curvature." It's as if Wheeler is casting you as an actor in some heavenly drama. In fact, that's the whole point. "We have first-hand experiences, and those are the ones we don't forget. They stay with us and hopefully they're meaningful enough that they're with you the rest of your life," Wheeler, who lives in California, has said. "That's pretty much what I've always been after. I've always tried to do that stuff that has an effect on you that you never forget the first time." Only a few people are allowed inside the room, and because David Zwirner's last blockbuster show—Yayoi Kusama's Infinity Rooms this fall—had people literally rioting in line outside the gallery, the gallery has instituted a reservation policy where you can reserve a 15-minute spot. It's absolutely something you should go see if you're in the city. I was disappointed to learn that no photography is allowed—after all, the allure of Instagram is a big draw—but after hanging out inside the space for a few minutes, it didn't really matter. The first-hand experience is simply way cooler than an iPhone photo—if you can get one. The show is on view at David Zwirner Gallery until March 29, 2014.